A van with an open roof and containing a number of mortar rockets was intercepted in Derry on Sunday. The find suggests the organisation, which regrouped last year, has significant technical skills and the capacity to mount relatively complex operations. Four men were held by the PSNI after the van was stopped on the Letterkenny Road in the city, just after 8pm on Sunday. British army bomb experts who attended the scene came under petrol bomb attack. Two of the men were later released unconditionally. It is thought the design of the van would have allowed four rockets hidden within to be aimed and fired at a considerable distance. A launching pad similar to the one recovered in Derry was used to attack (then) British prime minister John Major as he presided over a meeting of the British war cabinet. 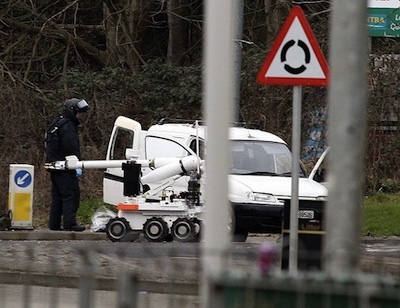 Local PSNI chief Stephen Cargin said the rockets were within minutes of being fired and suggested the target of the attack must have been the Strand Road barracks, one of the largest Crown Force bases in the North. The base has been the subject of countless IRA attacks over the years. In May 2010 a mortar bomb was fired at the same station, but failed to explode. It was claimed by another breakaway group, Oglaigh na hEireann. The same organisation claimed responsibility this week for two separate attacks on members of the British Crown forces, both involving booby-trap devices, in November and December of last year. It also said it was behind a punishment shooting in north Belfast last month. Amid the condemnation of this week’s attack, Stormont politicians nevertheless expressed confidence that the ‘new IRA’ has being subjected to blanket surveillance and deeply infiltrated by British informers. Their arguments appeared to be borne out when a former member of the ‘Real IRA’ was shot dead in County Meath, less than 72 hours after the Derry incident, following an apparent dispute within the organisation. Members of the Garda Special Branch who observed the shooting made five arrests, although one man has since been released. Sinn Fein’s Gerry Kelly claimed in a contentious internet message that the “dissidents are so infiltrated, its hard to know if they planned [an] attack on Derry people or state agents did”. “Whenever people did make similar comments [in relation to the Provisional IRA], senior Sinn Fein people were lining up to accuse them of mischief making and to attack them. But now he is making the same type of comment,” said the DUP’s Gregory Campbell. He said the same statement could have been made about past IRA actions. The East Derry MP claimed the Provisional IRA “was riddled with informers”, and it “wasn’t only Denis Donaldson, and others that we know about”. Sinn Fein deputy First Minister Martin McGuinness praised the PSNI for “intercepting” the mortars. He said: “It was through their good work that we are not talking about a disastrous situation in Derry,” he said. He later claimed to have received a death threat from a nameless dissident organisation in Derry. He said the PSNI had told him of “a real and active threat against his life”. “They linked the threat to my condemnation of the recent attempted mortar attack in the city and other remarks made in support of the PSNI”, he said, adding: “I will not be silenced”.